In such an American saturated market, it’s rare for a Canadian TV show to grab the attention of the nation. But that’s what Being Erica did. Of the very few well-known Canadian series in existence, only 2 have merited mention on this blog (Canadian editions of international shows don’t count, ie: So You Think You Can Dance Canada); as of today, that number is 3 (the other 2 are Slings & Arrows and Little Mosque on the Prairie). Being Erica has gotten rave reviews. I’ve had friends who barely watch TV tell me to watch this show. It’s been lauded as better than almost anything else to come out of the (admittedly weak) Canadian television industry. But, being in Boston most of the year, I never got to see it. Now, over the last 2 days, I’ve had the chance to sit down and watch the series’ first season online at CBC.ca (only 13 episodes). And I’ve gotta say, this might be my new favourite show. Starting with the basics, Being Erica is a full scale production. Coming in at the full dramedy length of 45 minutes an episode and lacking the low-budget folksy nature of small shows like Little Mosque, Being Erica has all the technical markings of a well-oiled machine of a production. They use stellar locations (more on that later), beautiful sets, actors who can actually act, writers who can write and effects guys who manage to make time travel not seem too hokey (serious credit also goes to the hair, makeup and wardrobe people on this one). A simple and goofy concept of a 30-something with regrets being given the chance to go back and fix her life, becomes a human and complicated and very funny story in the hands of very skilled storytellers. Creator Jana Sinyor developed a wonderful cast of characters in Erica’s friends and family, as well as Erica herself (a delightfully flawed heroine), who are just engaging enough to have the audience invested in their story and just frustrating enough to elicit a very cathartic sense of schadenfreude. The regrets Erica tries to remedy range from such seemingly trivial events as getting drunk at a school dance to such disastrous tragedies as the death of her brother. It’s this juxtaposition that gives Being Erica its extra something special. It is at once a joyful romp of a series, full of misadventures, cheesy voice overs and romantic escapades and a serious character drama about love, loss and disappointment. I also like that it’s a story about taking responsibility. Not like in a Seventh Heaven kind of way where you have to pay the price of “borrowing” your dad’s car by being grounded, but in a “we are the sum of our choices” kind of way. Unlike so many modern heroines, Erica isn’t an underdog plagued with the unfair constrictions of a society that doesn’t understand or deserve her. She’s just a girl; a girl who’s afraid of having peaked in high school; a girl who’s hit a few snags, made some wrong turns and ended up nowhere near where she thought she wanted to be; a girl who learns the lessons that Dr. Tom teaches and doesn’t make excuses for having to learn them. Erica’s just normal, insecure, optimistic and human; the biggest thing she has to overcome is herself, isn’t that the way it actually is? And then there’s Dr. Tom, the series’ resident advisor. He’s like God to Joan of Arcadia, the talking animals to Wonderfalls or the Quizmaster to Sabrina the Teenage Witch. Full of vague advice and quotations from everyone from Ghandi to Anthony Rapp, Dr. Tom leads Erica through her list or regrets, sending her back in time with some unexplained (and frankly, unimportant) form of magic. Season 1 ends with Erica breaking her agreement with Dr. Tom and his replacement (and polar opposite) arriving in Erica’s life, so the lovely quotation-heavy dialogue might disappear from season 2, but it certainly was a highlight of season 1. Another highlight was Erica’s best friend Ethan. Played by Wonderfalls’ Tyron Leitso, Ethan is just a sweet, boy-next-door crush-worthy character that I’m always happy to see on screen. Other favourites among the stellar cast are Reagan Pasternak as Erica’s boss, John Boylan and Kathleen Laskey as Erica’s bickering parents, Paula Brancati as spunky friend Jenny, Laurence Leboeuf as Ethan’s antagonistic wife Claire and, of course, the delightful Erin Karpluk as Erica herself. A little game of Vampire LARP, a Dirty Dancing-themed bat mitzvah, the world’s most awkward Romeo & Juliet balcony scene and the best use of “Hit Me Baby One More Time” in broadcast history also play heavily into my love of this show. But perhaps my favourite thing about the show is that it is, in the words of my friend Chris, “a love letter to Toronto”. For once, the greatest city in the world (in my opinion) is not dressed up as New York; it’s not supposed to be Chicago, LA, Paris or even a fictional Canadian town. 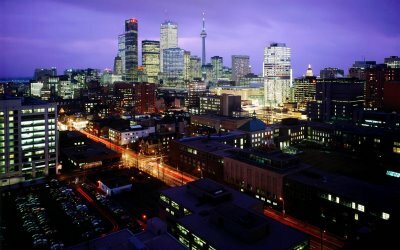 In Being Erica, Toronto gets to be itself, in all its multifaceted glory. With an unprecedented number of outdoor location shots, Being Erica explores its home city from trendy Front St. to posh Yorkville to the charming ambience of the Distillery District. They use locations like Toronto Island, The Royal Alex theatre and the Four Seasons Opera House as little shoutouts to their Torontonian audience, and this Torontonian eats it up. Appearances by actors I recognize from YTV, references to the Stratford Festival of Canada, scenes shot on the U of T campus and an episode set inside Casa Loma made me giddy with city pride and reminded me that while I may be watching a show of international calibre, it belongs to Canada; so, in a way, much more than all those other shows I invest myself in, Being Erica belongs to me. And I can’t think of any show I’d rather have. Ali Eisner on her "Favourite Things"